Walking blindly into a spider web is just about as pleasant as getting blind-sided by a poorly constructed website; one will give you the heebie-jeebies, the other will cost you money and both will leave you feeling icky. Spider webs are intricate, delicate, strong and vulnerable all at the same time. Websites are similar to the sticky filament in terms of both complexity of structure and in their mysterious construction. 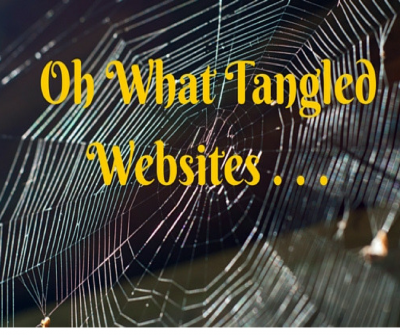 Let’s review the basic things you need to know before you hire a “web guy” and save you from that creepy experience. Let’s talk frankly about website builder websites for a change. They’ve gotten a bad rap, are they ideal for a large company – of course not; but they do serve their purpose for small business marketing. Understand that even a decent website starts around $1,500 – give or take a few hundred, depending on how many pages and the level of complexity of your site. This is true regardless of the platform. If you only have $500 to spend, you’re better off using a website builder and building the site yourself. When you start dealing with individuals or companies who promise you a website that cheaply – you’re asking for problems. One company came to us who had a site that was badly botched and they couldn’t even get the company to fix the site or take it down. Even after having us create a new website with a new domain, the old site still showed up in search results before their new, accurate site because the old domain had been around longer. So understand that in marketing – you get what you pay for, and when it comes to websites you may n+ot even get what you paid for! Some web people will dismiss website builder websites which use templates but they will happily put you on a Word Press site using a template without ever explaining to you the difference – they’ll charge you more because you think it’s worth more. In some cases that certainly does make sense depending on the company’s objectives, because there are aspects to WordPress that website builders simply don’t have. But if you don’t get good SEO with your new WordPress site, then it doesn’t really matter that you paid more than had you gone with a website builder. Some “web guys” will build your site on a website builder then turn you over to a hosting package which prevents further updates to your site – ever. This means you won’t be able to make even the smallest of changes; you will have to have a company redesign your entire site all over again – even if you just want to add a new page! There’s nothing wrong with website builders, in fact, they’re extremely affordable for very small businesses and we have, in the past, used them for certain clients. Just make sure you don’t get hoodwinked into saving a few bucks by downgrading after the site is done. Skip the gourmet coffee for a couple of weeks and stick with your website builder/hosting package. Websites are living breathing things, there’s no such thing as a site you publish live and never touch again. Hosting like Linux with cPanel or Host Gator are used when you have an alternative means to access your website. Website builder websites do not have an alternative means for access; the site is accessed through the website builder log in so don’t let your “web guy” or IT person talk you into switching to just a hosting package. Don’t get me wrong, they really do think they’re looking out for you, but they don’t understand the differences, which is why you want to make sure you’re working with a knowledgeable marketing company. Another scenario you might run into is a “web guy” who will tempt you with a custom designed site written in code. Unless you have a budget ranging from $10k to $40K on up, you aren’t going to get a “custom coded” website worth looking at. First of all, there’s a reason template sites are popular, first and foremost they’re affordable. Secondly, a large percentage of these templates have been user-tested (Huge advantage!) and are aesthetically pleasing (Hugely important!) and some are proven layouts for generating conversions (Most important of all!). Template sites look pretty darn good without any customization, and in the right hands with a little creativity, will be uniquely yours and look nothing like the original template anyway. Some of the low budget “custom coded” sites look like they were designed 12 years ago (ancient by digital age terms) because anyone who is charging that little for a custom coded site isn’t getting much work – because they aren’t very good. 1. Work with a company who will explain the pros/cons of different platforms. 2. Be sure to have a contract from your marketing vendor with deadlines outlined. 4. Know what company will be hosting your website (and the breakdown of costs) and how often it is backed up. 5. You NEED to keep access to usernames and passwords. Even if the site is managed for you, you need the passwords. 6. Be very clear with your expectations and listen to make sure the marketing company is repeating back to you the same message. At Vision Force Marketing we put you on the platform that makes the most sense for you. We’re not pushing a particular product or selling you one thing because that’s all we know, we’ll put you on the best website platform you need to grow your business.